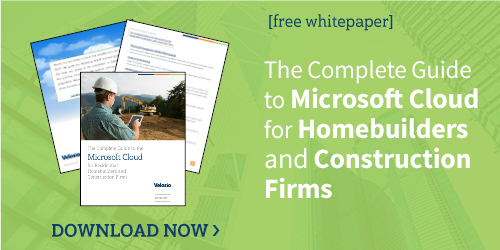 Velosio supports more homebuilders and specialty contractors with integrated solutions and software than any other Microsoft partner – worldwide. Most organizations have invested in several standalone point solutions that address different areas of need. The largest and most successful companies go beyond point solutions by creating a unified ERP system, either through extensive integration of best-of-breed technologies or through standardization on a single technology platform. The Microsoft cloud can help construction and contracting firms improve productivity, operations, sales, marketing, and customer engagement, and should be a serious consideration for any company within this space. Velosio offers an array of solutions specifically designed for homebuilders and specialty contractors, providing the business results that firms need. Leveraging Microsoft Dynamics 365, Microsoft Azure, Microsoft Power BI, and Microsoft Office 365, any size residential homebuilder, specialty contracting, or construction firm can deploy a truly unified construction management solution, providing robust functionality for every business function and employee role. Azure Northwest needed an ERP to integrate with its BuildTopia homebuilding software. They selected Dynamics SL to gain better control over their data.